In many large cities across the globe, thieves and swindlers hunt travelers and tourists who could easily fall prey to their scams. 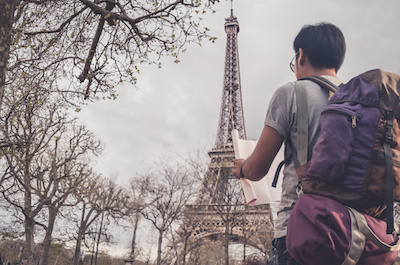 Tourists are frequently targeted on the streets of Paris by scammers, often working in teams, to steal their valuables. Recently, Paris Police have posted warnings to travelers concerning the latest tactics, focused on hotel guests. Flight Attendants laying over in Paris are cautioned and encouraged to become familiar with the details of this latest scam. Focused on hotel guests, this gang of thieves is highly skilled at blending in. They will use young women, or even children, to pull at your heartstrings, cause diversions and distract a hotel guest while a "teammate" makes off with the guests luggage. Additionally, these thieves are willing to take risks, but they also calculate those risks. They prey on the most vulnerable, taking the paths of least resistance. They are experts in determining who they can swindle. This means, if they see that you are exuding a seasoned traveler's confidence, using good awareness techniques, habitually observing your environment, they will take notice, and are far less likely to target you with their techniques. The thieves have become so proficient with the scam, that they can even pick hotel rooms’ electronic locks. We encourage Flight Attendants to not only bolt their hotel room doors as an added precaution of safety, but to use the safe in your hotel room to secure valuables (Link device, computers, cell phones, etc.) as well as sensitive documents or credit cards. Practicing good awareness techniques while traveling can help keep us safe, and protect us from becoming a victim of these crimes. Even if we are in an unfamiliar city, we can and should always present the appearance we know where we are going and we should always remain aware of our surroundings. The best way to do this is to never travel alone and, if possible, travel with someone familiar with the surroundings. Remember, even “friendly strangers” who offer to show you around can also have the potential to be a threat or swindle. For additional information, we advocate Flight Attendants to read the following publication, Paris Police are Warning Tourist about Gang of Hotel Thieves, written by Jessica Puckett or contact your Local Council for additional information.